German Breakaway Artist Group under Max Liebermann. 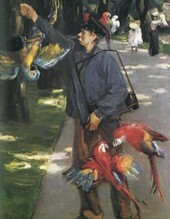 One of the last art movements of 19th century German art, the Berlin Secession (Sezession) was a breakaway group of artists who in 1898 'seceded' from the city's arts establishment and, led by the eminent painter Max Liebermann, established an independent exhibition society, in order to champion new forms of modern art - rather than continue to churn out the old-fashioned academic art favoured by the Berlin Academy. This was the third major Sezession movement - the others being the Munich Secession (1892) and the Vienna Secession (1897) - after the initial breakaway in Paris (1890). The latter event occurred when the Société Nationale des Beaux-Arts (and its exhibition arm the Salon au Champs-de-Mars) was formed as a modern alternative to the official Société des Artistes Francais (and its Salon de Champs-Élysées). The term "Secession" was first coined by Georg Hirth, editor of the cultural magazine Jugend, which was instrumental in promoting Art Nouveau (also known as Jugendstil). These and other Secessionist artist groups rejected the official arts governing bodies due to the latter's distaste for avant-garde art like Impressionism, forms of Post-Impressionist painting and Naturalism, as well as their restrictive exhibition policies, which tended to favour established painters and sculptors over their younger, more modernist colleagues. The Secessionist movement represented a direct challenge to the official academies of fine art, and to their royal patrons. The Berlin Secession, for instance, offered a modernist alternative to the conservative art championed by the Berlin Academy and its imperial patron Wilhelm II, which typically consisted of high-brow history painting, and traditional landscape painting, as well as monumental sculpture glorifying Germany and the Hohenzollern dynasty. Along with Max Liebermann (1847-1935), other members of the Berlin Secession included many of the city's most talented modern artists, like the sculptors Kathe Kollwitz (1867-1945) and Ernst Barlach (1870-1938), and and the painters Walter Leistikow (1865-1908), Max Klinger (1857-1920), Lovis Corinth (1858-1925), Edvard Munch (1863-1944), Emil Nolde (1867-1956) Ernst Ludwig Kirchner (1880-1938), Erich Heckel (1883-1970), Max Beckmann (1884-1950) and Karl Schmidt-Rottluff (1884-1976). Berlin art was largely controlled by the official Academy of Arts - founded in 1696 by crown-prince Frederick III of Brandenburg, as an "Academy of Painterly, Sculptural and Architectural Art", and the official Association of Berlin Artists (Verein Berliner Kunstler) - both of which were presided over by the Prussian painter Anton von Werner (1843-1915) - under the watchful eye of the German emperor Wilhelm II, whose conventional aesthetics led him to decorate the city with such monstrosities as the Neo-Roman Gedachtniskirche (Memorial Church, 1891)and the over-large Dom cathedral (1894-1905), as well as over 30 monumental sculptures along the Siegesallee, commemorating events from Prussian history. The highlight of the official arts calendar was the Great Exhibition of Berlin Art (Grosse Berliner Kunstausstellung), which was organized by the Association of Berlin Artists. During the run-up to Secession there were several controversies. In February 1892, a number of Berlin artists set up the "Free Association to Organize Artistic Exhibitions". Later, in November, an exhibition of paintings by Edvard Munch opened at the Berliner Architekturhaus. Visiting members of the Association of Berlin Artists were so shocked by Munch's works that they closed the exhibition. In response, the modernist wing of the Association set up a new progressive exhibition body known as the Group of the Eleven, whose members included Walter Leistikow, Max Liebermann, Max Klinger and Ludwig von Hofmann. The struggle between Berlin conservatives (led by von Werner) and progressives (led by Liebermann and Leistikow) continued in the Academy and the Association for most of the 90s. Then, during the Grosse Berliner Kunstausstellung of 1898, a major scandal errupted when the German emperor Wilhelm II refused to approve prizes won by Kathe Kollwitz (on the grounds that she was a woman!) and Walter Leistikow (because he painted trees blue!). For the Berlin avant-garde, this was the final straw. On May 2nd, sixty-five Berlin artists - following in the footsteps of colleagues in Munich and Vienna - formed a new artists association known as Berliner Secession. Max Liebermann was elected its first president; other founding members included: Lovis Corinth, Ernst Barlach, Edvard Munch, Max Slevogt, Kathe Kollwitz, Max Beckmann and Heinrich Zille, as well as the Berlin modern art dealer Paul Cassirer. The first exhibition of the Berlin Secession - involving 300 paintings and 50 sculptures - took place two weeks later on May 19, 1899 in Charlottenburg. After this, the Berlin Secession held two shows a year. For more than a decade, Secessionists and the arts establishment maintained an uneasy coexistence. The latter maintained their overall predominance, but the rebels gradually became a familiar and accepted feature of German art, prompting Liebermann to declare: "Yesterday's revolutionaries are today's classical artists!" However, just like the Association of Berlin Artists had proved unable to satisfy its more modernist members, so the Secession proved unable to satisfy its more radical members. 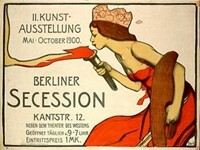 In 1910, after Liebermann rejected 27 expressionist paintings by artists like Max Pechstein (1881-1955), Secessionist radicals (centered around former members of the Dresden group known as Die Brucke - The Bridge) formed a breakaway group known as the New Secession (Neue Secession) and pointedly staged a rival exhibition called "Rejected Artists of the Secession Berlin 1910". This new avant-garde body had as its mouthpiece Sturm magazine (1910-32) published by Herwarth Walden (Georg Lewin), and later Walden's Sturm Gallery (1912-25). The Worpswede Group, The Bridge (1905-13), Blue Rider (1911-14) and more. Characteristics of expressionist painting and sculpture. Gauguin, Van Gogh, Modersohn-Becker, Matisse, Kandinsky, Marc and others. German school founded in Weimar by Walter Gropius.  For more about modernist painting and sculpture in Germany, see: Homepage.